Create incredible, edible cake art sure to wow everyone's eyes - and taste buds! - using the Cake Boss Decorating Tools Airbrushing Kit. Powered by a sturdy, compact 18 PSI compressor unit, the chrome-plated airbrush offers consistent, steady airflow with three adjustable levels - high to cover large surfaces, medium for basic airbrushing designs and low to create fine details or script. Simply turn on the compressor, pour your choice of color into the reservoir and apply your own designs to cakes. Use the airbrush to create colorful blue skies and green fields, to stencil, to write phrases like "Happy Birthday," and to accent cakes and cupcakes with dots, swirls and other details. Let your own imagination flow! 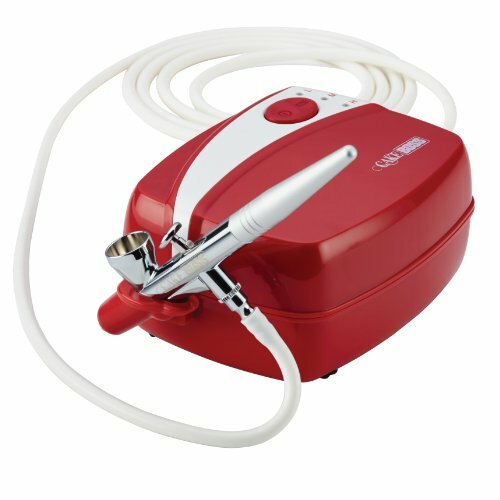 The cake decorating airbrush is attached to the compressor by a flexible rubber hose and the kit includes a plastic dropper for transferring colors from mixing containers to the airbrush reservoir, an A/C adaptor and a special tool to help keep the nozzle clean. A case and convenient instruction booklet are included and this professional-quality, easy-to-use cake airbrush kit partners perfectly with fondant rollers, impression mats and the other great Cake Boss Decorating Tools and Bakeware supplies. Ideal for everyone from beginners to experts, Cake Boss Decorating Tools always make baking and decorating easier and more enjoyable.